No beans, no tomatoes – it’s all about meat and heat. 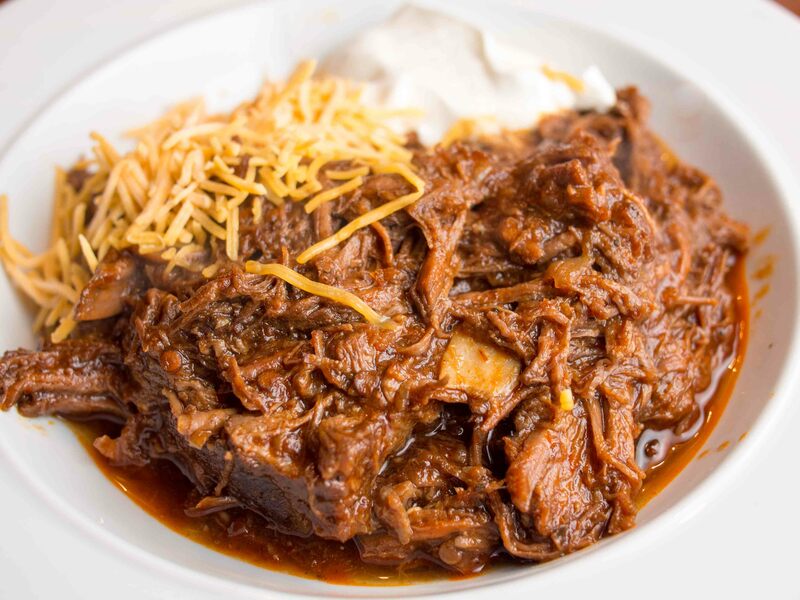 This is a modern version of the chili dish that the Aztecs introduced to the Spaniards and that the Mexican vaqueros brought north with them. A warm and hearty dish like this to ward off the sub-zero weather is just what a lot of us need right now. Pre-heat your oven to 300°F. Wearing gloves, stem and seed the dried chiles. Cover with hot (but not boiling) water, and let steep until they are softened – about 30 minutes. While the chiles are soaking, coat the roast with a little peanut oil on all sides and then dust with salt and pepper. Heat the remaining oil in a large dutch oven until smoking. Sear the roast on all sides until browned (about 4 minutes a side). Remove roast to a plate. Drain the chiles, discard the soaking water. Put the chiles, can of Chipotles, garlic, cumin, oregano, and about half the stock in a food processor and give them a whirl until they form a smooth sauce. Put the onions in a layer in the bottom of the dutch oven. Top with the roast and any accumulated juices. Pour chili sauce over it all and add enough of the remaining beef stock to bring the liquid in the pan about a quarter of the way up the roast. Bring to a simmer over medium heat. Put the lid on and move to the whole works to the oven for an hour. Braise the roast for an hour, then flip it over and add more stock if needed. Continue cooking until very tender, about 2 1/2 to 3 hours total. Remove the roast from the pan and set aside to shred the meat (I used a 9×13 cake pan to keep everything contained). 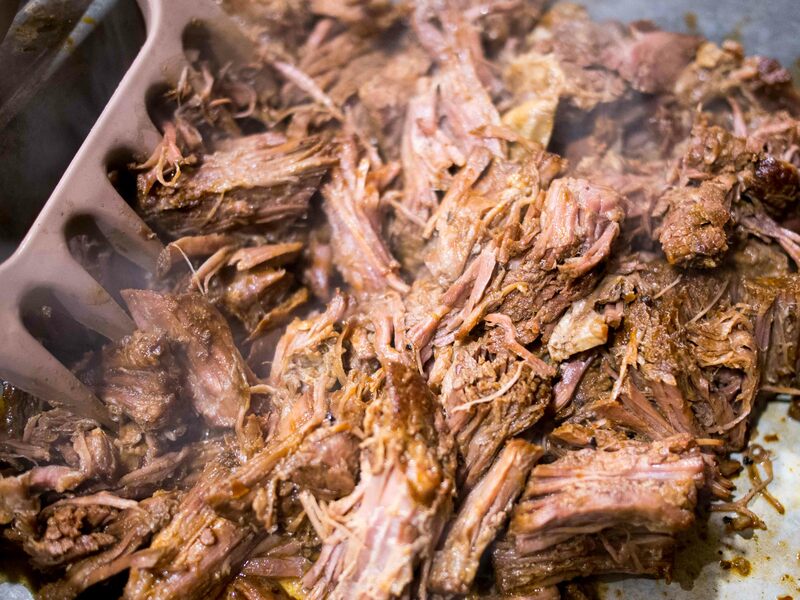 Shred the meat and remove any nasty bits. I used a pair of bear paws to break it into bite-sized chunks. 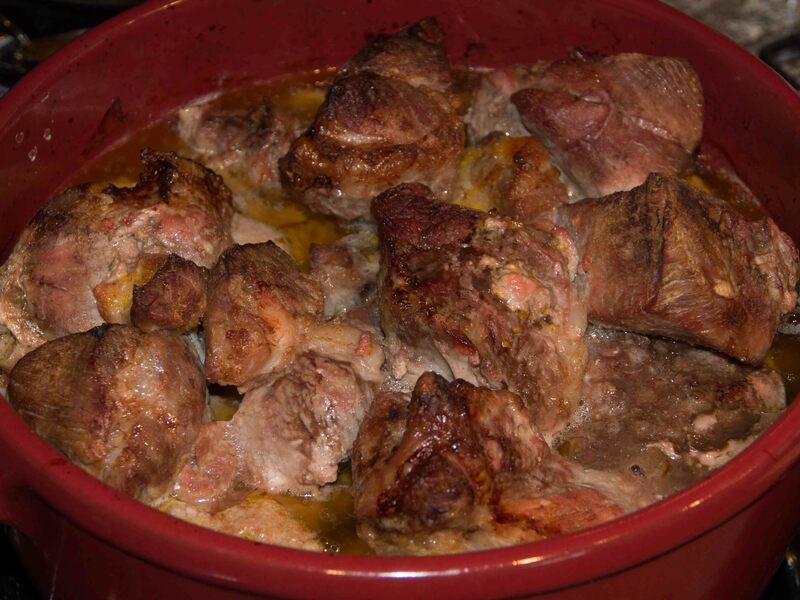 Return the meat and any juices that have accumulated back to the Dutch oven. 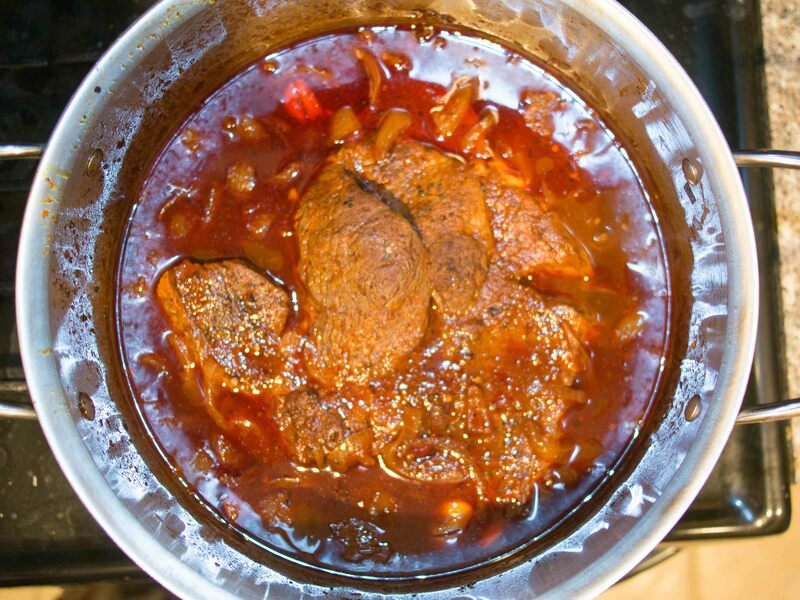 Move the Dutch oven to the stove top and bring chili to a simmer. Taste and adjust seasoning. Let cook uncovered until the chili is thick and the meat has completely fallen apart. Serve this with cornbread and garnish with cilantro, diced white onion, sliced radishes, sour cream, chopped green onions, grated cheese, avocado, tortilla chips – you name it. This was a very rich and filling dish. Very meat-centric, but the Guajillo and Chipotles kept it interesting with a nice complex, smoky, and lasting heat. I can sure see any leftovers being used as a filling for tacos or tamales. As always, the impending Super Bowl gives me yet another reason to whip up some wings. This is a hotter version of my Oil Drum Chicken Thighs. Normally I would do these on the Big Green Egg, but the Polar Vortex forced me to hunker down and use the oven. Put the salt and garlic in a food processor and pulse until the garlic is minced. Add the hot sauce, vinegar, oil, Worcestershire sauce, onion, pepper, celery salt, basil, and parsley and give them a whirl until they are well-combined. Reserve half for basting the chicken. Put the chicken in a zip-top bag and coat with the other half of the marinade. Squeeze the air out of the bag and seal. Marinate in the refrigerator for at least 4 hours, overnight is better, and 48 hours rocks. Pre-heat your oven to 375°F. Set a wire rack inside a large rimmed baking sheet or jellyroll pan. 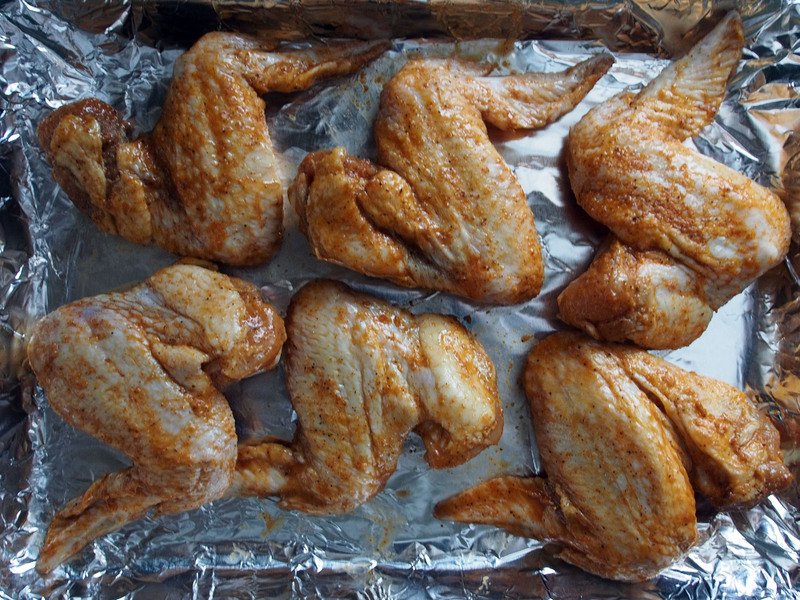 Remove the wings from the marinade and arrange on the rack. Bake for 20 minutes, then flip and baste with the reserved marinade. Bake for another 20 minutes, then flip and baste again. Repeat every 10 minutes until the wings are crispy on the outside and at least 180°F on the inside (about 80 minutes total). My dear wife really liked these wings, but I have some reservations. I liked the complex flavors that made them much more than your usual hot wing, but the balance was off. They needed more heat, less Worcestershire, and maybe some more salt and garlic. That said, I think they have great potential and am looking forward to playing around with the flavors. P.S. Look for my lacto-fermented hot sauce recipe soon. 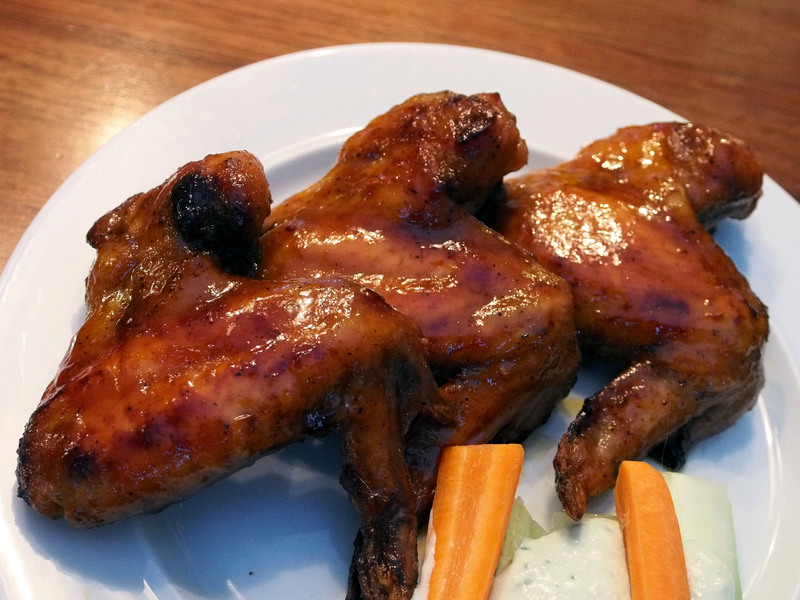 I was so happy with the way the marinade worked its way into my Slashed Cornell Chicken Quarters that I wanted to give the same thing a try with my favorite part of the chicken – thighs. Make the marinade by putting the garlic, shallot, and salt into a food processor and pulse until the garlic and shallot are minced. Add the vinegar and give it another whirl to combine. Let sit for 5 minutes while the vinegar sweetens the shallot. Add the oil, herbs, Worcestershire, and peppers to the processor and whirl to combine. Taste and adjust seasonings. 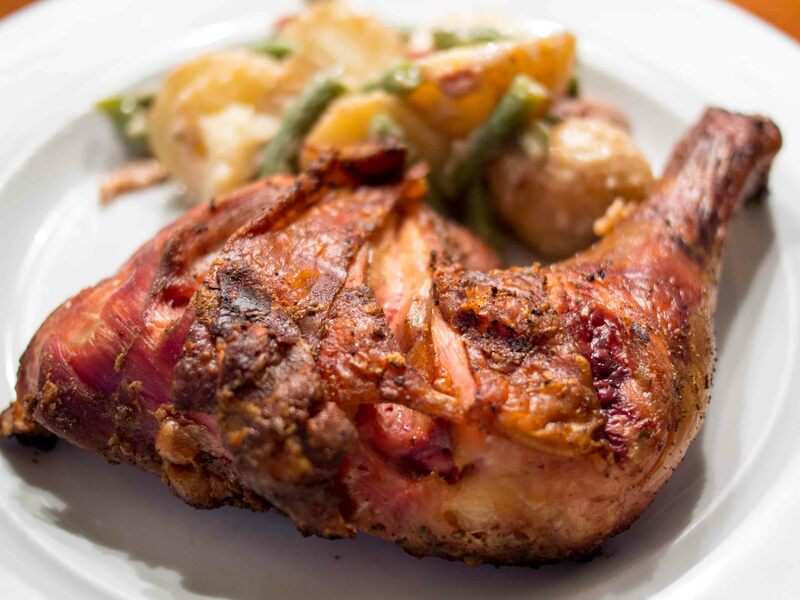 Slash the chicken thighs with a knife, making one deep cut perpendicular to the bone. Trim off any extra fat or skin. Put the thighs in a zip-top bag and pour the marinade over them. Turn to coat, then squeeze the air out of the bag, seal it up, and stash in the fridge for at least 4 hours (overnight is even better). Turn the bag every so often to make sure all the pieces get a coated in the marinade. Remove the thighs from the marinade and give them a dash of salt on each side. Arrange them on a rack set over a pan (I used a 9×13 baking rack) and return to the fridge uncovered. This will help crisp the skin. Set your grill up for an indirect cook at medium-high (400°F) heat. I used a plate setter on the Big Green Egg to give me nice diffused heat. When the grill is up to temp, arrange the thighs on the grate skin side up. Close the lid and let it cook for 20 minutes. Flip and cook skin-side down for 20 minutes. Flip again and cook skin-side up until the chicken is done – 180°F internal in the thickest part of the thigh. 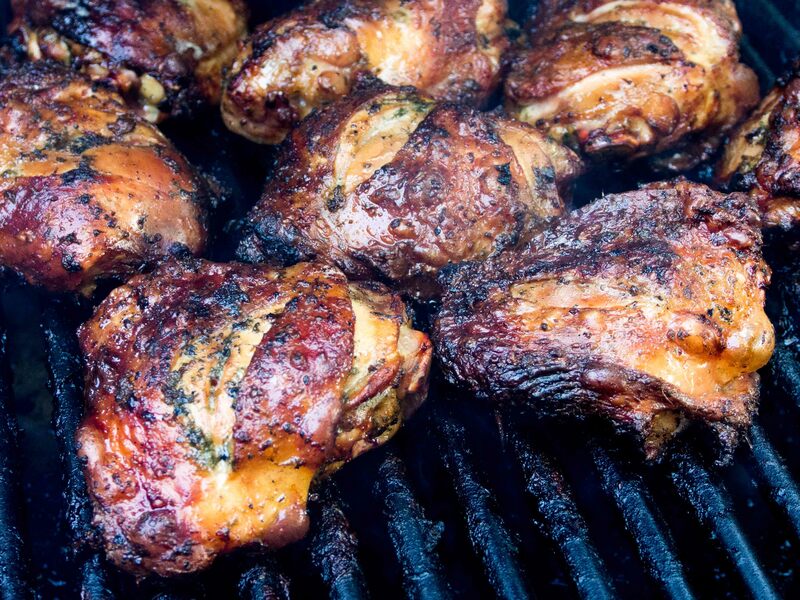 Remove chicken from grill and let rest 10 minutes before serving. The chicken was tender, crispy, and very herbalicious. Slashing the thighs seemed to both help the marinade move deepier into the meat and make the skin crispier. Overall though, the marinade lacked some oomph. Next time – less oil, more Worcestershire, vinegar, salt, and red pepper. 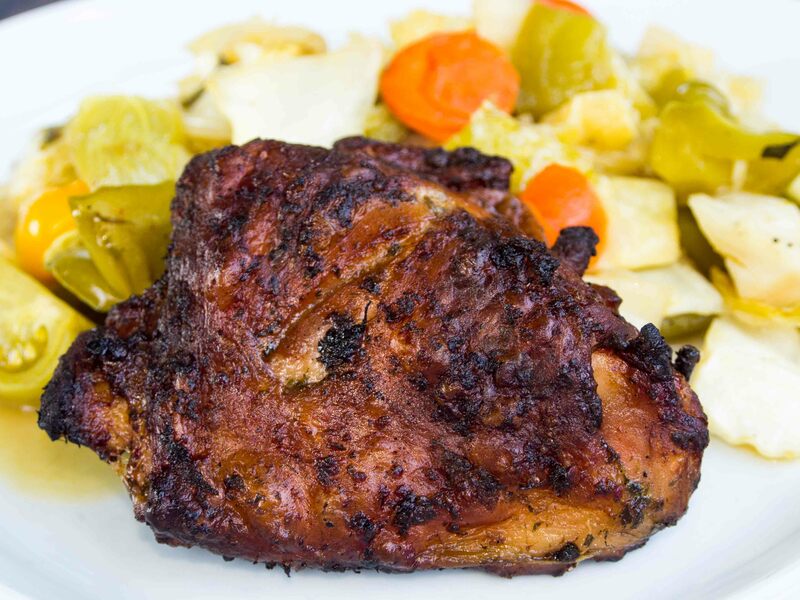 3 ounces of chicken thigh meat is only about 100 calories and 4 Weight Watchers points. 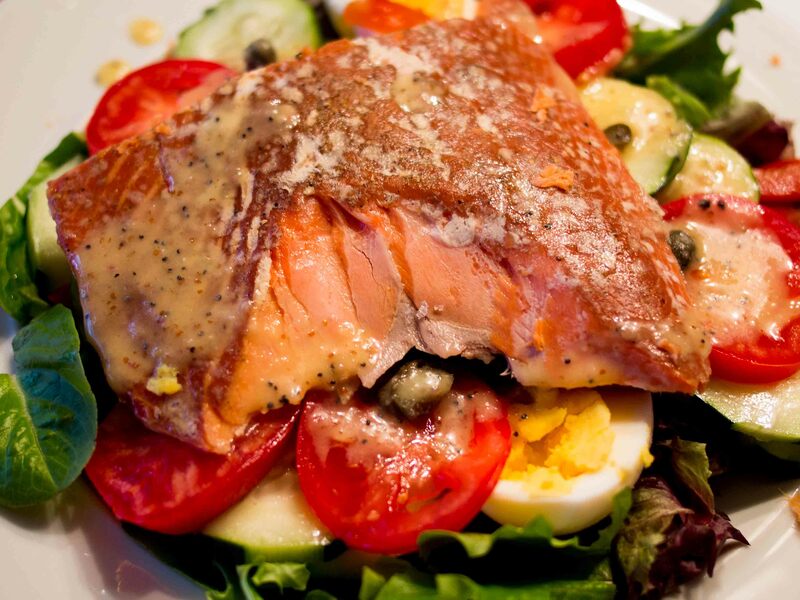 Sassafras Smoked Salmon Salad – try saying that five times fast. I was down in central Iowa and made a stop at Hawgeyes BBQ to pick up some supplies. They had sassafras smoking wood, which I’d never seen before. 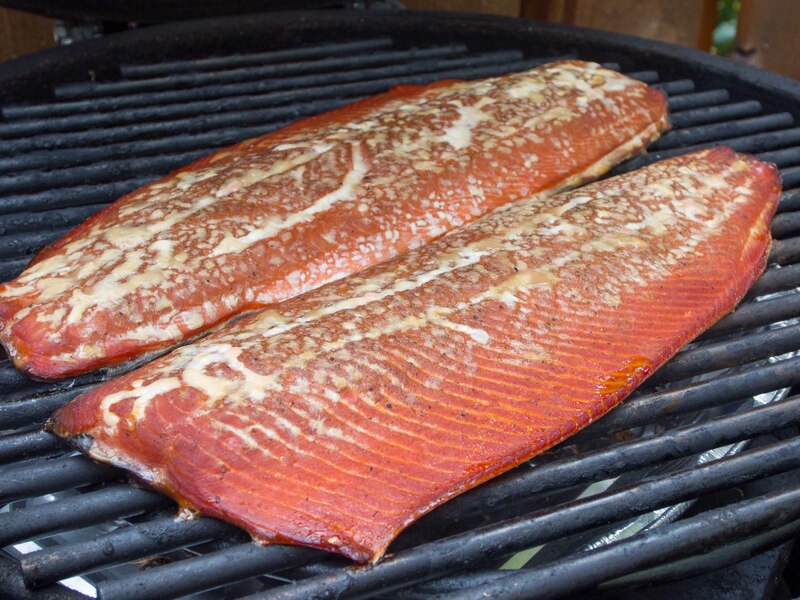 One sniff of that sweet, anise/root beer aroma and I knew I had to smoke some salmon with it. Combine the salt, sugar, and Bay seasoning in a small bowl and mix well. This is the cure. Lay the fillets flat in a zip-top bag. Cover both sides of the fillet with the cure mixture. Seal the bag and place in fridge for at least 12 hours, but no more than 24 hours. Turn the fillets over every 3-4 hours. Remove the fish from cure, rinse well in cold water and pat dry. Place the fish skin-side down on a rack. Move to the fridge to dry until surface is dry but slightly sticky to the touch – 1 to 3 hours. Set up your grill for a 3 hour indirect cook at 225°F. Add your smoking wood (sassafras, of course) and smoke until the fillet hits 160°F internal and starts to flake – about 2 hours. Smoked salmon freezes nicely, so I smoked 2 fillets and Food-Savered off all but about 12-ounces for this salad. Put the shallot and salt in a blender and pulse to mince the shallot. Add the vinegar and let sit for at least 5 minutes to sweeten the shallot. Add the mustard, honey, and vinegar. Blend to combine. With the blender running, pour in 2 or 3 drops of oil, then continue pouring the oil in a thin stream until all of the oil is emulsified into the vinaigrette. Taste and adjust seasoning. Stir in the poppy seeds, bottle, and stash in the fridge for up to 2 weeks. I served this as a make-your-own salad with mixed greens and an assortment of toppings. In the summer, I make a batch of this dressing up at least once a week. It’s the crack of the salad dressing world – rich, sweet, and tangy, and it goes together quickly, tastes good on a wide variety of salads, and doesn’t separate in the fridge. What’s not to love? The salmon came out sweet and salty with a subtle root beer taste that worked really well with the Chesapeake Bay seasoning. Can’t wait to make up a batch of dip with the rest of the fillets. It’s salmon and veggies – go easy on the dressing and you’ll be fine. I’d like to say that it’s a deliberately thought-out, painstaking-researched recipe, but it was really just the result of a happy accident – running out of peanut butter. Substituting roasted peanuts makes a world of difference. Combine the soy, sugar, fish sauce, lime juice, oil, sriracha, and cumin in a small bowl. Stir until the sugar dissolves. Put the chicken in a zip-top bag and cover with the marinade. Toss to coat. Squeeze the air out of the bag, seal it, and put it in the fridge to marinate for at least 4 hours, overnight is better. Put the peanuts and garlic into a food processor and give them a whirl until they turn into fine crumbs. Add the sesame oil and process until they form a thick paste, like a chunky peanut butter. Add the coconut milk and process until it forms a smooth, velvety sauce. Add the soy sauce, sugar, fish sauce, curry paste, lime juice, and Sriracha and whirl to combine. Stash in the fridge and take it out just before you skewer the chicken to let it warm up a bit. Set your grill up for a raised direct cook over high (400°F) heat. Remove the thighs from the marinade and thread 2 or 3 onto each skewer. Grill chicken about 10 minutes per side, until they hit at least 180°F internal. I like mine closer to 200°F, but in either case you’re looking for some crispy bits on the outside without overcooking the food. Remove from heat when done and let rest 10 minutes before serving with peanut sauce and Sriracha on the side, and with maybe more peanut sauce drizzled on top, or eaten straight from the bowl with a big spoon. The title should really be “Chicken Satay with the BEST FREAKIN’ Spicy Peanut Sauce Ever!” The chicken was very good, but the sauce was outstanding – thick and rich with a strong peanut flavor and a nice, warm depth from the red curry. 3 ounces of chicken meat is only about 100 calories and 4 Weight Watchers points. Sriracha is practically free, but the peanut sauce is pure, calorie-laden pleasure. I’ve been in the mood for some porky comfort food, but it has just been way too cold and wet to make it on my Big Green Egg. So I moved this carnitas recipe inside to the oven. Cut the roast into 3 to 4-inch chunks, discarding any stringy connective tissue, but keeping all of the fat. Combine all of the ingredients in a Dutch oven, and give it a stir. Put the lid on and move to the oven. Let it simmer for an hour. The orange juice should be bubbly and the fat in the meat should have started to render out. Remove the lid, stir, and return it to the oven uncovered to simmer for another hour. Keep checking and stirring once an hour until most of the liquid has evaporated and the pork has started to fry in its own fat (about 3 hours total). As it gets closer to being done, start checking and stirring the meat every 15 minutes to make sure the meat is getting crispy, but not becoming dry or burned. Total cook time for this batch was just shy of 5 hours. 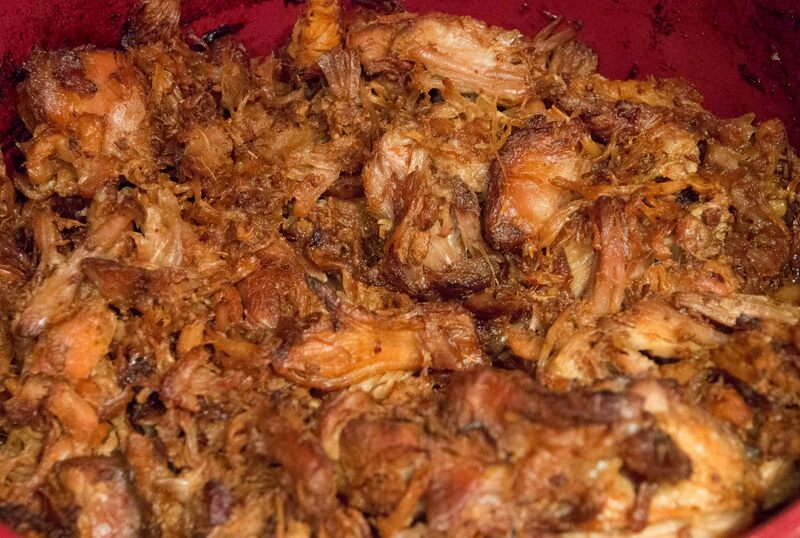 Remove the carnitas to a serving dish using a slotted spoon. Cover and keep warm while you put the sauces together. Pit the avocado by cutting it lengthwise around the seed and then twisting the two halves apart to expose the pit. If you are brave and good with a knife, hold the avocado half with the pit in the hand that you can afford to lose (you can use an oven mitt to protect your hand, but you lose style points ;)) . Tap the pit with the heel of a chef’s knife blade hard enough that the knife sticks into the pit. Twist the pit out, then slap the knife’s tang flat against the edge of a trash can edge to release the pit. Take a little bow. If you have more common sense than you do knife skills, just twist the halves apart as above, then use a tablespoon to pop the pit out. Once the pit is out, use said tablespoon to scoop the avocado flesh out of the skin and into a food processor. Add the mayonnaise, ranch dressing mix, buttermilk, shallot, garlic, cilantro, lime juice, and jalapenos. Give it a whirl until everything it blended smooth. Taste and adjust seasonings. Stash in the fridge while you make the cheese sauce. In a medium sauce pot, melt the butter and add the flour to it. Whisk together and cook flour and butter for a couple of minutes over moderate heat until it starts to bubble. Gradually whisk in the milk until it is smooth. Simmer gently until the sauce is thick enough to coat a spoon, about 5 minutes. Remove from the heat and whisk in the cheese, cayenne, and paprika. Keep whisking until everything is smooth and melty. Taste and adjust seasoning with salt and pepper. Keep warm over low heat. 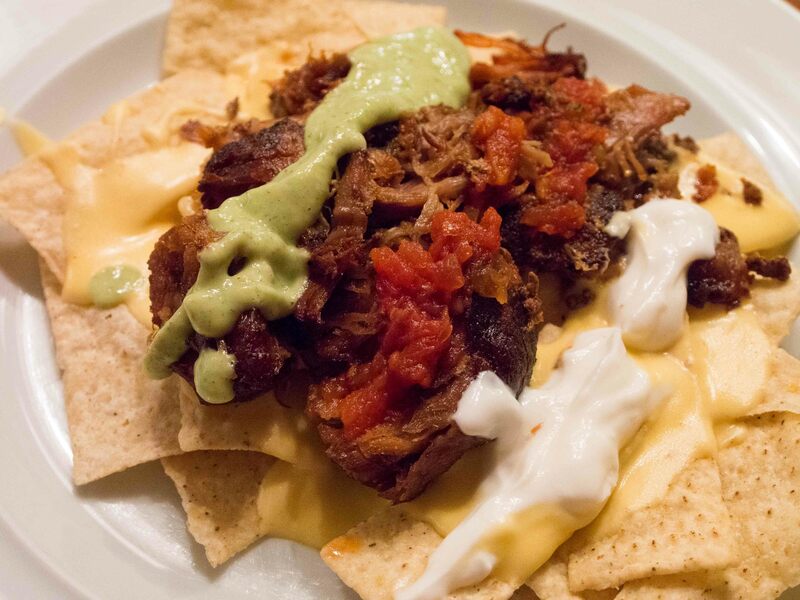 Assemble nachos by alternating layers of chips, cheese sauce, meat, avocado, salsa, sour cream, more chips, just smidge more meat, hot sauce, maybe some more cheese, etc… until you have your personal nacho nirvana. Aside from not having the smokey goodness that the grill adds, these carnitas rocked – crispy, juicy, and tender. I really liked the added orange juice as the citrus sweetness played real well with the earthiness of the anchiote. Both sauces were very tasty, but the avocado sauce was a real standout – smooth, fresh, and herby. Carnitas will never be diet food. Four ounces of meat is 5 Weight Watchers Points and 190 calories, so use it sparingly. The cheese sauce won’t do you any good either, but the avocado sauce is lighter and more flavorful than guacamole, so you can save some calories there. 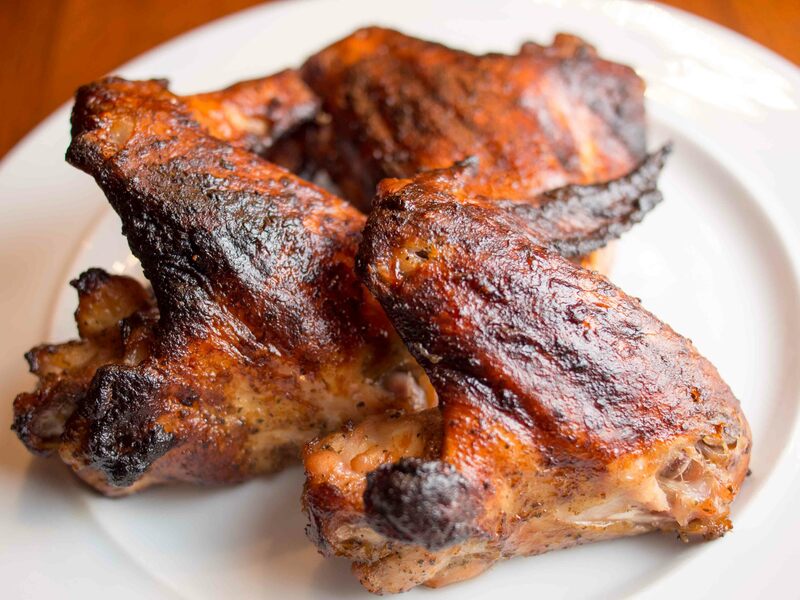 A good chicken wing needs 3 properties – it must be crispy, it must be spicy enough to require a cold adult beverage, and it should be flavorful enough to be addictive. This is my attempt at hitting the wing trifecta with a wet rub followed by a sweet and spicy sauce. I combined the garlic powder, onion powder, paprika, celery salt, black pepper, salt, hot sauce, oil, and Worcestershire sauce and let it seep for about an hour. Then I put the chicken in a zip-top bag and covered it with the rub, tossing to make sure everything got coated, then stashed it in the fridge overnight. The next day I headed out to fire up the Big Green Egg, but the sub-zero wind chill drove me right back inside. 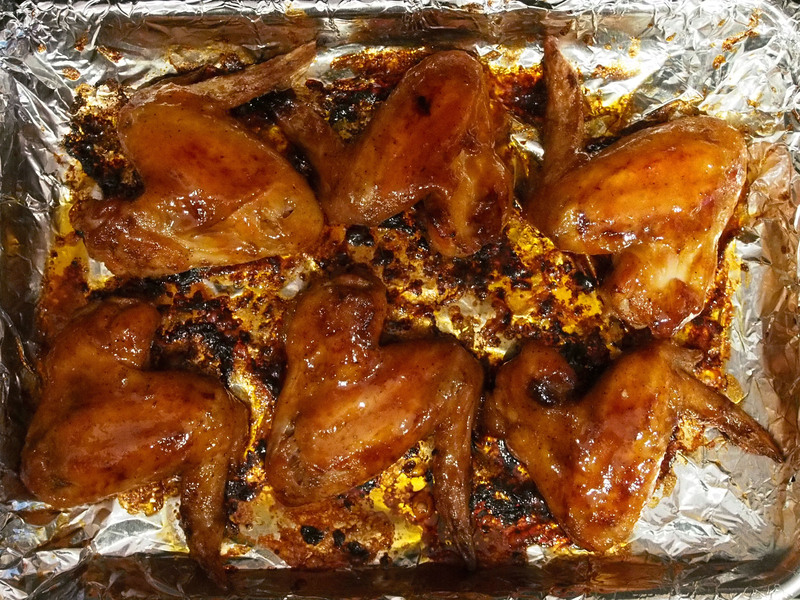 So I arranged the wings on a small roasting pan and put them in the oven at 350°F. While the wings were cooking, I made up my sauce. I melted the butter in a small saucepan, then whisked it together with the hot sauces, sugar, honey, and Worcestershire. I brought it to a boil for a minute or so, then moved it off to a warm back burner. After the wings had been cooking for 20 minutes, I put the breasts and tenders on a small roasting pan and put them in the oven. When the wings had been on 40 minutes, I flipped all of the chicken pieces and brushed on a heavy coating of the hot sauce. Ten minutes later I flipped everything and sauced them again. The breasts and tenders were done, so I moved them off to a covered serving dish. I let the wings go another 10 minutes, then sauced them one last time and served them with a bleu cheese dip. Aside from not having the smokey goodness that the grill adds, the only thing these wings lacked was crispness. The combination of two different pepper sauces gave the wings plenty of beer-craving heat while the balance of flavors in the rub and the sweetness of the sugar and honey kept me coming back for more. The rub/sauce combo is a keeper, but next time these are going raised, indirect on the Big Green Egg until they are nice and crispy. Baking (instead of frying) and using non-fat sour cream as the base for the dip gets these wings down to 3 Weight Watcher’s points a piece. It’s joyous thoughts like that that make me yearn for warmer climes. To try and break my funk, I made up a rack of baby back ribs that packed a sweet heat reminiscent of jerk dishes I’ve had in the Caribbean. Wearing gloves, seed and devein the peppers. Put the salt, shallot, and garlic in a food processor and pulse until the garlic and shallot are minced. Add the peppers, soy sauce, oil, vinegar, sugar, rum, lime juice, thyme, black pepper, allspice, cinnamon, ginger, and nutmeg and give them a whirl until they are well-combined. Makes about 3/4 cup. Reserve 1/4 cup of the marinade for the barbecue sauce. Prep the ribs by removing the membrane on the bone side and trimming off any scraps of meat or excess fat. Put the ribs into a zip-top bag. Pour the remaining 1/2 cup of the marinade over the ribs, turning to coat. Squeeze the air out of the bag, seal it, and stash in the fridge overnight. In a small saucepan over medium heat, combine the mango nectar and 1/4 of the raw sugar. Bring to a boil and cook until the mixture has reduced to about 3/4 cup – about 10 minutes or until the mixture is thick enough that it starts to spit at you. Reduce heat to medium and add the remaining raw sugar, reserved marinade, tamarind, and cider vinegar. Stir to combine and bring to a simmer over medium heat. Cook until all the sugar has dissolved and the sauce starts to thicken a little bit (about five minutes). Bottle and store in the fridge until you are ready to use it. Set your grill up for a raised direct cook at 300°F. I didn’t use anything between the ribs and the fire to diffuse the heat, but did use a Woo2 extender to raise the cooking grid up about 4 inches further from the heat. When the grill is up to temp, add your smoking wood (guava in this case), and when the smoke changes from white (bad) to blue (good), put the ribs on bone side down for an hour. Flip the ribs bone side up and let them go for another hour. 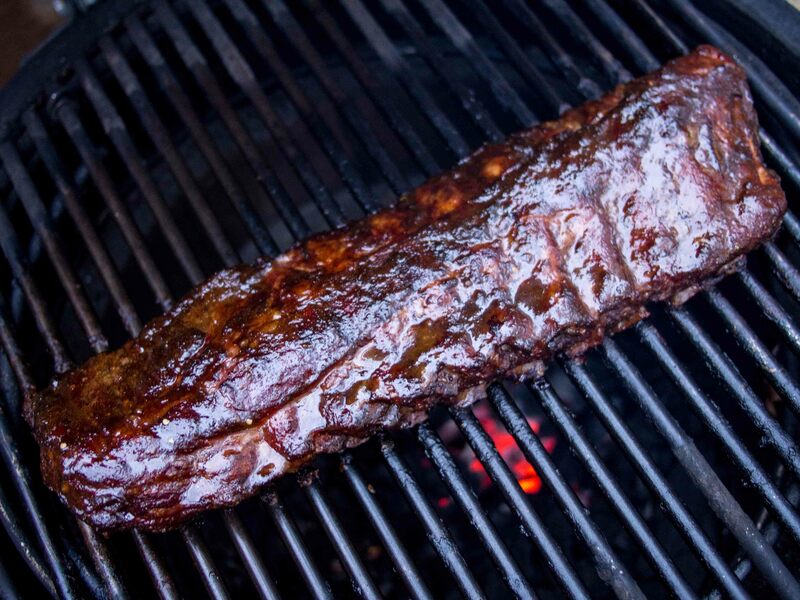 Flip the ribs back to bone side down and start checking signs of being done – the slab cracks when you pick up one end with a pair of tongs and the meat has started to pull back from the bones. This rack started looking done at the 3 hour mark, so I slathered both sides with some of the barbecue sauce and put them back on bone side down for another 15 minutes. I slathered the meat side again and let them go another 15 minutes. I gave the meat one last coating of sauce and moved the rack off the grill to rest for 10 minutes before serving. This was one fine rack of ribs – all the heat and spice of traditional jerk but with a sweet and fruity base. It was one of those eat, sweat, wipe brow, swig adult beverage, repeat, kind of meals. Next time I would use about 2 cups of the thicker mango nectar you can buy in refrigerated boxes in most mercados. This was the thinner Jumex canned version, and it just didn’t have oomph. 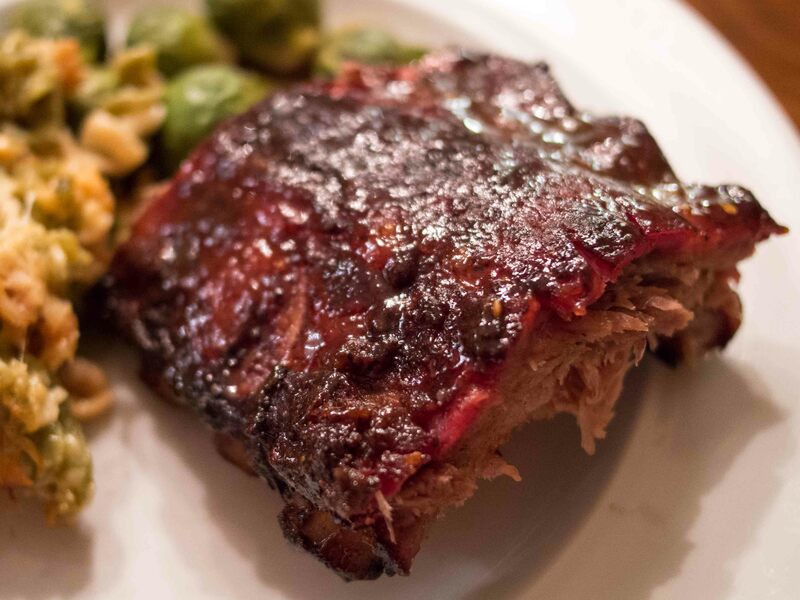 Ribs still won’t ever be diet food – 460 calories for 8 ounces of meat (4 to 6 bones worth) and 12 Weight Watchers points. But they were sure the cure for the gray blahs. I can’t tell you how much this book has changed the way I think about cooking. I’m used to cook books that are nothing but recipes. 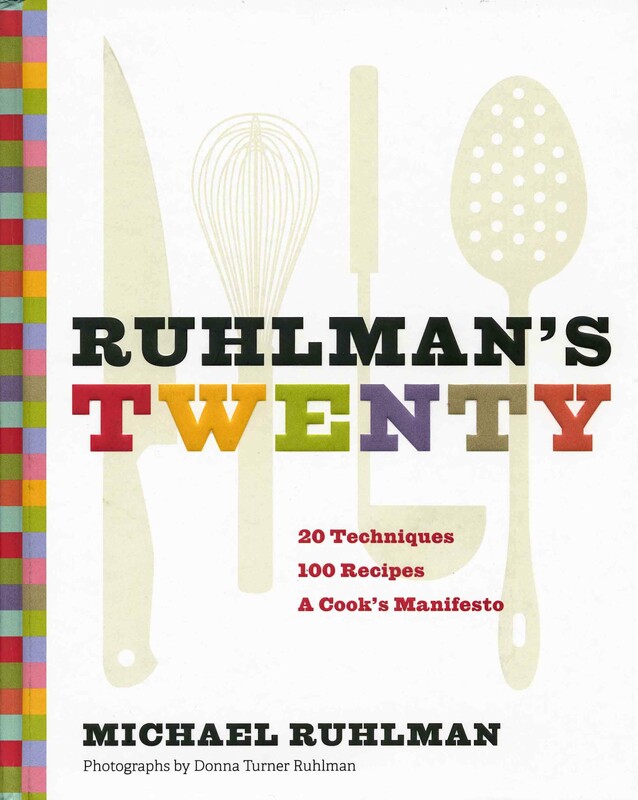 Ruhlman’s Twenty has plenty of those, but they’re all wrapped around the 20 core cooking tools and techniques that Ruhlman has distilled from his years of being a chef and writing about food. Before this book, to me an egg was just an ingredient. Now they are Technique #6, little oval kitchen workhorses – cooked gently they become a meal unto themselves, while egg whites leaven souffles by incorporating air, and egg yolks emulsify simple oil and acid into that amazing concoction we call mayonnaise. Even the shallot (Technique #4) becomes a bit of a wonder in Ruhlman’s book. I always though of them as uppity onions, but mince them with some vinegar (Technique #5) and whirl them with some olive oil and you’ve got a quick vinaigrette (Technique #12) that works wonders when paired with cold veggies and beats anything that comes in a bottle. Of course, being a grillmeister and all, I was most interested in his Technique #18, Grill: The Flavor of Fire. Having recently secured a very nice rib roast, I decided to try his grill/roast technique using a wet rub to season the roast. Make the wet rub by putting the garlic, salt and peppercorns into a food processor and pulse until the garlic is minced. Add the oil, vinegar, Allegro, rosemary, thyme and paprika and give them a whirl to combine. You’ll need a flame-proof roasting pan (I use an old 9×13 baking pan) with a rack. Put the roast on a cutting board with the deckle (fat cap) on top. Score the fat by making shallow diagonal cuts in a diamond pattern at about 1-inch intervals. Pour half of the wet rub over the roast and work it into the cuts. Turn the roast over and cover the bottom and sides of the roast with the remaining rub. Set aside and let rest while you set up the grill. 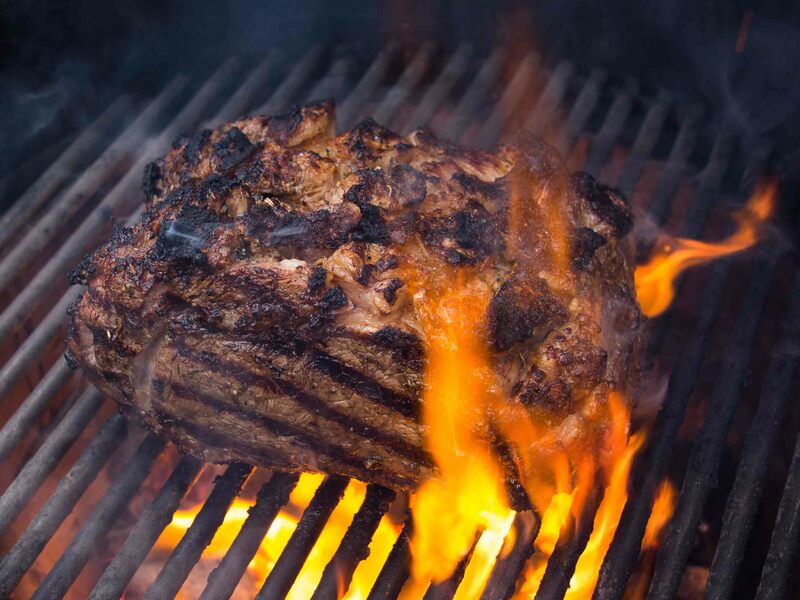 The heart of Ruhlman’s grill/roast technique is to sear the meat over a hot, direct fire, give it a rest, and then finish it over lower, even heat. The sear gets you that crispy, tasty crust. The resting time stops the heat from pushing too deeply into the meat, giving you an evenly-cooked roast with more lovely medium-well meat and less gray, over-cooked meat. It also lets you control when you serve the meat. 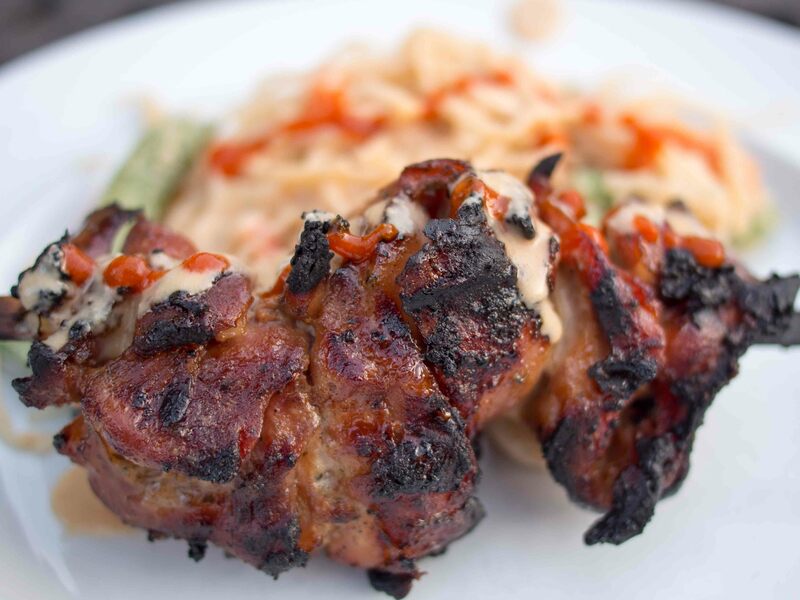 Once the searing is done, you can finish it right away on the grill (or in the oven, if you must), or stash it in the fridge for up to a day before finishing it right before serving. For the sear, set your grill up for a direct cook over high heat (500°F). Get the cooking grate is nice and hot and sear the roast for 90 seconds on each side. When the roast is browned all over, move it to the rack (fat side up) set in the roasting pan. If you are finishing it later, move the roast to the fridge until it is cool and then wrap with plastic wrap. If you’re serving it right away, tent loosely with aluminum foil and set aside to rest for at least 30 minutes while you get the grill down to the roasting temperature. Close the lid on the grill and adjust the vents to reduce the heat to 300°F. On the Big Green Egg, I shut the vents almost all the way down and added an inverted (legs up) plate setter to diffuse the heat. You could also use a flame-proof pizza stone, sheet pan, or trivet to give you indirect heat. When the grill is down to roasting temps, put the roaster loaded with the meat back onto the grill. Add about a cup of water to the roasting pan to keep the juices from burning. Cook for about 15 to 20 minutes per pound, or until it hits 130°F internal. 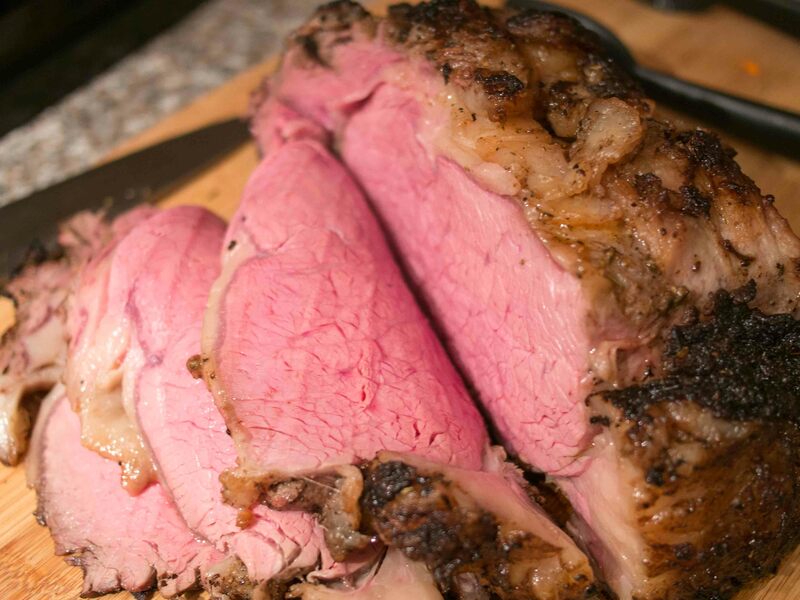 Move the roast to a cutting board and let rest for 20 minutes before carving and serving. I made this for my dear mother’s 82nd birthday dinner and everyone loved it. The roast had a nice, wide band of tender, rosy-red meat with a great crunchy char on it. Slicing the deckle let the bits of fat fry themselves into a kind of beefy bacon. Perfect. As for Ruhlman’s Twenty, I find myself reaching for this more than any of my other cook books. I’m not always making recipes from the book, but I am always leveraging his techniques. When you get to be 82, you get to quit counting calories. Sometimes my recipes come together as the result of a series of happy accidents. With this one, I had read about slashing chicken quarters to get the marinade to penetrate deeper over at Griffin’s Grub, and that seemed like a great idea. Then I read Meathead’s post on Cornell Chicken, and that sure sounded tasty. And then I found myself back in my hometown for the weekend and my Mom mentioned that the local meat department I like had chicken quarters for cheap. Voilà ! – Slashed Cornell Chicken Quarters. Make the marinade by putting the garlic and salt into a food processor and pulse until the garlic is minced. Add the egg and process until it starts to thicken. Add the vinegar, seasoning, and pepper and whirl to combine. With the processor running, add the oil in a steady stream. The mixture will begin to thicken and form an emulsion, kind of like a very thin mayonnaise. Slash the chicken quarters with a knife, making several deep cuts perpendicular to the bones. Put the quarters in a zip-top bag and pour the marinade over them. Turn to coat, then squeeze the air out of the bag, seal it up, and stash in the fridge for at least 4 hours (overnight is even better). Turn the bag every so often to make sure all the pieces get a taste of the marinade. Set your grill up for either an indirect cook or a raised direct cook at medium-high (400°F) heat. I like to fire roast skin-on chicken to keep it crisp, so I set up for a raised indirect cook using an extender to move the cooking grate up higher in the Big Green Egg’s dome. This way the chicken is getting cooked with a nice, large, even amount of heat on both sides. 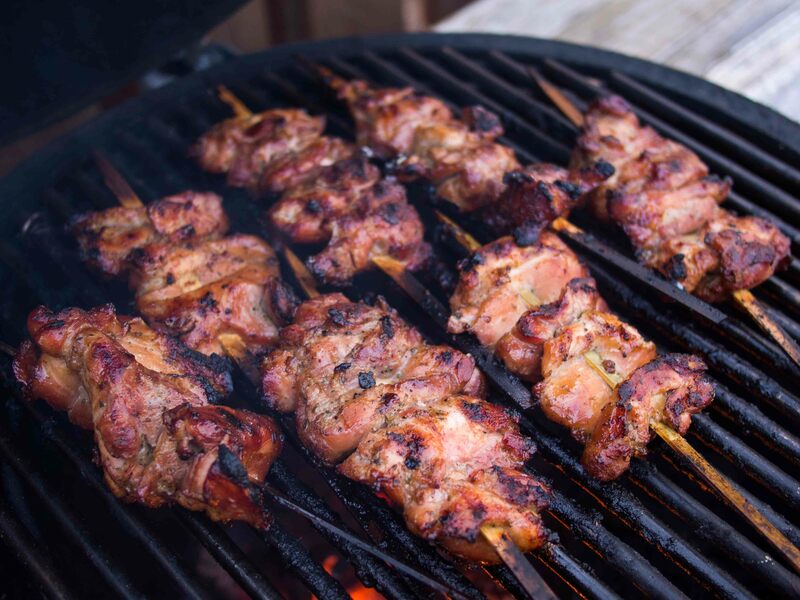 When your grill is up to temp, remove the chicken quarters from the marinade and arrange on the grate skin side up. Close the lid and let it cook for 20 minutes. Flip and cook skin-side down for 20 minutes. 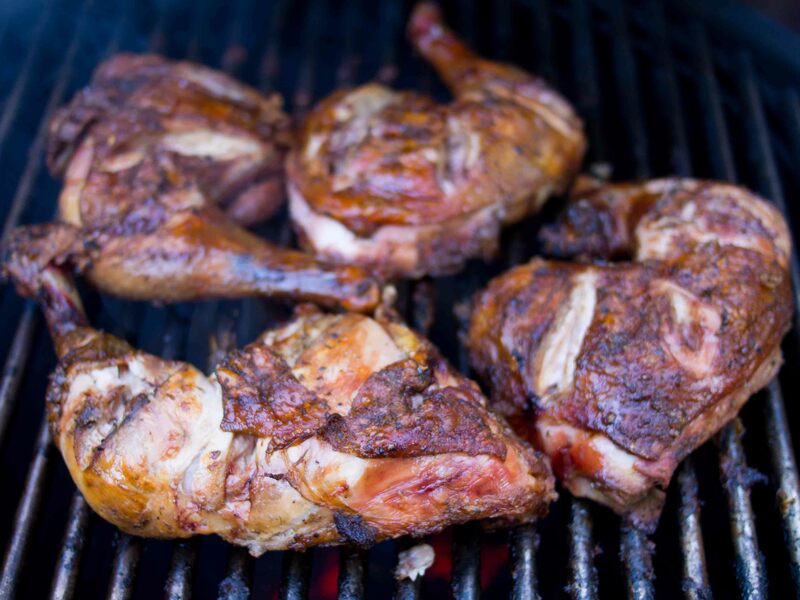 Flip again and cook skin-side up until the chicken is done – 180°F internal in the thickest part of the thigh or until the leg joint moves easily and the juices run clear. This was the absolute crispiest chicken I’ve ever made. It almost tasted like it had been fried. It was so good that my dear wife, who never eats chicken skin, loved it too. I’m sure that a lot of the crispiness was due to slashing the skin, giving fat more places to bubble its way out and get some air under the skin. Then why 4 stars? Note that I didn’t baste the chicken – I should have. Using the marinade as a baste would have built up the flavors quite a bit and done more to help keep the chicken moist. My fault for not reading the original recipe as well as I should have. One chicken leg quarter is 300 calories and 8 Weight Watchers points.